Oh yea Baby. Wicked cool game! When I heard some time ago that Ubisoft was bringing the hit PC game FarCry to the Xbox, I really was not hoping for much. FarCry really pushed the PC to its limits and came out with a visual gaming experience like no other. Well I should not have worried too much because what Ubisoft did was create a new game all together for the Xbox. This version as did the PC version pushes the Xbox to its brink and makes it play like a strata various. FarCry Instincts out passes the first FarCry and I never thought that would happen. 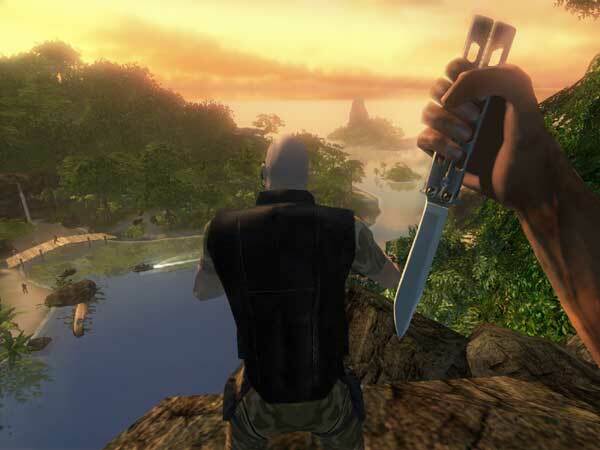 As with the Original FarCry, this time around in FarCry Instincts you play as Jack Carver, The retired Navy guy who now makes a bit of a living at taking tourists on tours of the islands. This is where the fun begins, when a woman shows up with a bunch of money and wants you to take her around the Islands all the locals stay far away from.something is wrong. Don't do it Jack! But of course you do it. That's when mercenaries attack Jack's boat and it's destroyed. Nothing but kindling left. Now it's up to you to save the passenger (Hey she is kind of cute.) and in all of this stay alive and find out what the heck is going on in this island chain. Like all good first person shooters the game takes place from a certain characters perspective and in this case it's Jack Carver. The game just grabs you from the start with its incredibly stunning graphics, and the presentation of the story is just out right fun. As a player you really get involved with everything that's going on from the very start. The game play is a lot of fun also. For those players that are used to running around and blasting away at everything that moves, you may get a bit of a shock here and also end up with getting the character dead several times before you figure out that there is a certain amount of stealth and ambush playing that has to be done if your going to make it in this adventure. The mammoth sized levels are just perfect for some multiplayer mayhem too. A bit on the multiplayer game play in a bit. Unlike some first person shooters that feel a little short at times, FarCry Instincts delivers a very health sized single player experience. Just something about being in some jungle and being at one time prey and then the next your are the hunter.it's just these twists and turns that make this game hard to walk away from. If all of the single and multiplayer goodness wrapped up with incredibly lush graphics and pulse pounding sound was not enough, they even have a level editor included just to keep the game rolling along far past the main games experience. Now let me confess something here. I am notorious for skipping past most tutorials. I mean sure I'll play with it if I am doing a review just so I can see what it has to offer. But for the most part I'll skip it if I am just playing the game for myself. Not so with FarCry Instincts. The games tutorial actually comes in handy since it shows the player not just how to get around and take on the bad guys.but it also teaches the player how to survive. One of the really cool things in FarCry Instincts is the ability for the player to set booby traps. These are really fun to use against a bunch of enemy if you manage to set several of these branch traps and then lure them into the kill zone. Just don't make the mistake I did and walk into your own trap, because it will spring and it will hit you. Soon Jack develops some rather interesting abilities. 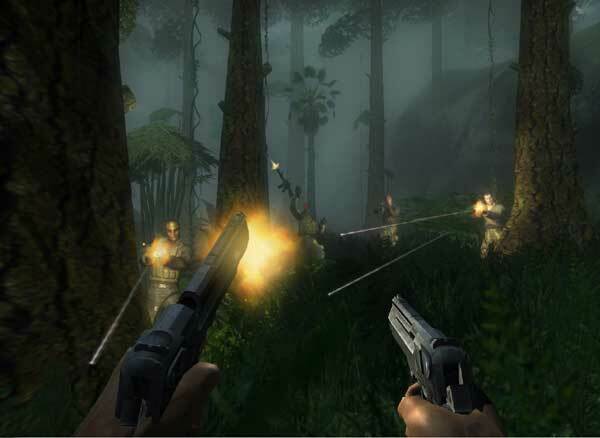 Primal in nature there are times when the mercenaries are in fear. These are great times as your stalk your prey. Claw attacks are now very much a good weapon. The special abilities come in handy and give Jack a real edge since he can see scent trails of the enemy. (Almost like in the Wolverine game) The abilities come with a limit of course since it's all fueled by adrenaline, this can all be restored by finding powerups or by hunting an enemy. It builds up and then oohhh Baby. Fresh Meat! There are various vehicles in the game, these include humvees, jet skis, hovercraft, and hang gliders, and my favorite all terrain vehicles. While the vehicles are a bit hard to control, I still love running around on them. Now for the down side. 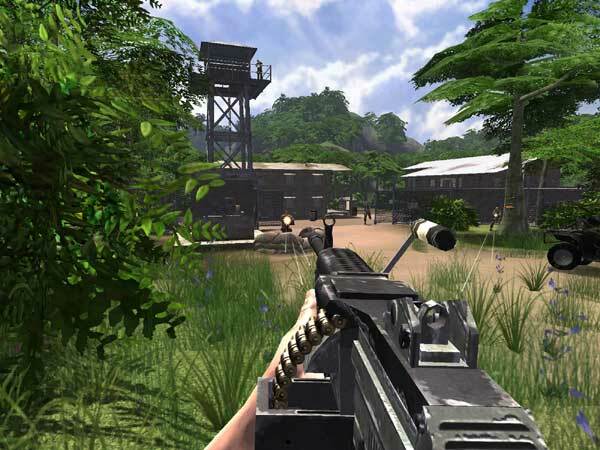 Just like FarCry for the PC, FarCry Instincts also uses a checkpoint system. What is the big deal you ask? If you have ever played a game where there are large areas and you cannot save until getting to the next level or position and the enemies just happen to be very very hard in the area. You will know frustration when you have to keep starting the same level over and over again. While this is not a game breaker by any sense of the word. It sure the heck will tick you off. Now back to what I was saying earlier about multi player. Multiplayer is lots of fun, with the usual bag of tricks and goodies for all of us sicko gamers who enjoy an evening or two of blasting away at our friends. Multi player up to 16 players on xbox live or system link. The types of multiplayer gaming fun are as listed here. 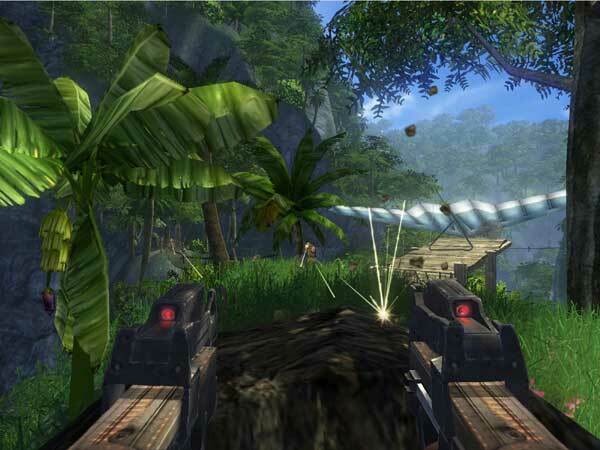 The Far Cry Instincts version of deathmatch. The first player to reach the predetermined kill number wins the match. Types of weapon available in the map. Power-up placed in the map (become the predator for a predetermined time). Up to four teams can battle against each other. The threat will come from several directions, and the first team to reach the predetermined number of kills wins the match. Type of weapons available in the map. Our version of Capture the Flag. The player has to steal a sample in the enemies' camp and bring it to his camp to score a point. The player carrying the sample can use his weapon and toss the sample to a teammate. When a team reaches the predetermined number of points, they win. Types of weapons available in the map. A group of mercenaries is trying to get across the map to reach a transmitter and send the kill sequence. Once the sequence hits zero, the predator is dead. To reach the transmitter, the mercenaries will have to go through the predator's territory. The predator will have the complete set of evolutions (Feral Skills, Stronger, and Regeneration). There will be one predator for every four mercenaries. The predator will respawn if killed, but in order for a mercenary to respawn, his teammates must kill the predator. Mercenaries will win the game when the kill sequence hits zero and the predator will win when all mercenaries are dead. Type of weapon available in the map. As I said earlier the game also comes with a built in level editor. If the game has a choke point it's the level editor. Don't get me wrong, the thing is pretty powerful for a level editing tool. It's just figuring the darn thing out that gives me cause for pause. But as with most gamers this is only a small bump in the jungle road. FarCry Instincts does what very few games have done. It's a complete packaged gaming experience that you will just have to play to really appreciate what I am relaying here. 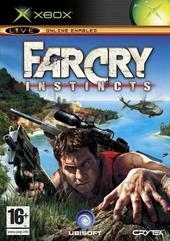 FarCry Instincts is pulse pounding ride that plays on so many senses and on so many levels.